As 11-year-old Eliezer's breathing becomes harder each day, the family constantly fears one day he'll stop breathing. To the untrained eye, the Greenwald family of Jerusalem is like any other large Jewish household. One of the children, however, has faced unique challenges in his short life. 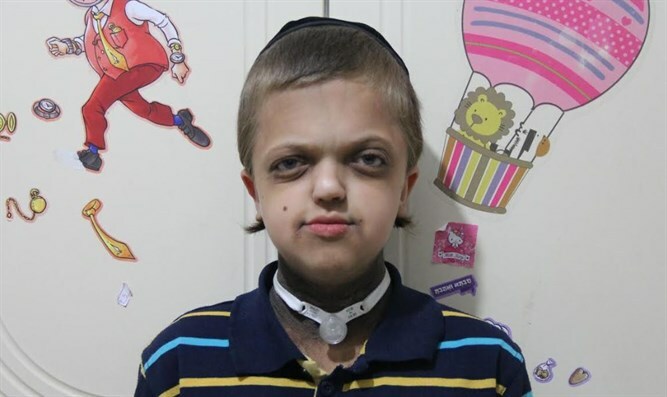 Eliezer, 11, was born with facial deformities which affect the way his features align with his skull. Besides the obvious issues of bullying and isolation, it has had one major health repercussion: Eliezer is unable to breathe independently. He is attached at all times to a breathing machine. While other children run and play outside he remains indoors, fighting for each breath. What has always been a challenge, however, has escalated to a threat: Eliezer’s condition is getting significantly worse over time. With his breathing becoming more arduous each day, his parents are living with the constant fear that one day he will simply stop breathing. Having consulted with top medical professionals and rabbanim, the Greenwalds have been advised to take their son as soon as possible to a treatment facility in Houston, Texas. They've been faced with a seemingly insurmountable obstacle to their son’s health, however: Travel, surgery, and post-op treatments come out to an overwhelming $60,000. The working-class family couldn't possibly aspire to paying such a fee on their own. That is why they have started an emergency fund in hopes that together with the help of Klal Yisroel they can save Eliezer’s life.